Camping is a favorite pass time for a lot of people during the summer months. While camping, a lot of people like to have a campfire as the sun starts to go down or first thing in the morning. Campfires can be used for roasting marsh mellows or hot dogs. It can also be used to keep warm from the cool mountain chill when the sun goes down. Starting a campfire can sometimes be tricky. Here are some tips and tricks to start your campfire and keep it going. First of all make sure you use rocks as barrier if you plan on starting your fire directly on the ground. This will prevent the fire from spreading. Now you will need to gather sticks and logs. The drier they are the better your fire will burn. When you start the fire it is best to use smaller sticks and wood to start out. If you start out with bigger logs it will be hard to start. You will also need dry leaves or paper of some kind. This can be newspaper, paper towels, ect. Crinkle up the paper and lay it in the circle barrier you made. Now place the leaves on top of the paper. Now you will want to put the smaller sticks on top of that. If you place the sticks in a teepee shape, it will be easier for the fire to breath. Now you can light the paper on fire with a lighter or matches. 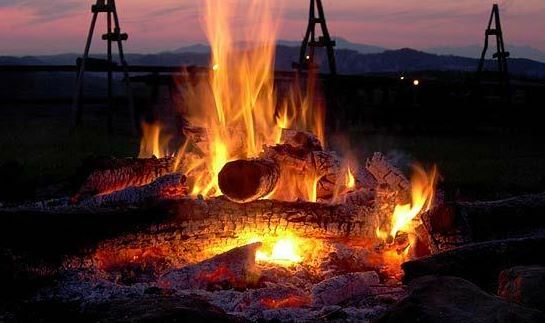 Once the sticks are burning good, you can gradually add larger pieces of wood to the fire. Now your campfire should be roaring in no time! Now a little safety. Remember, if the wind is blowing it may not be a good idea to start a campfire as it can quickly turn into a forest fire. Even if you have a rock barrier around it, the wind can carry hot ashes to dry areas of the forest. Also remember to put your campfire out with water or dirt when you are finished. Now that you know how to start your campfire you are ready to go enjoy a peaceful camping trip and roast some marsh mellows and hot dogs!